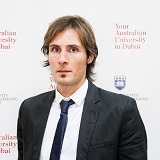 Dr Stefano Fasciani is an Assistant Professor at UOWD’s Faculty of Computer Science and Engineering. With a PhD specialising in integrative sciences and engineering from the National University of Singapore, Dr Fasciani is a specialist in digital sign processing, embedded systems, interactive systems, digital electronics and sound and music computing. He has a vast range of international experience, having worked in Singapore for seven years as a Postdoctoral Research Fellow at Nanyang Technical University, Singapore and as a Research Fellow at the National University of Singapore. He has also travelled extensively throughout Europe during his time working on two large research projects funded by the European Commission in his role as a DSP Application Engineer at Atmel Corporation, Italy. Dr Fasciani is currently collaborating with ICRAM, a French institute for the science of music and sound in Paris. Dr Fasciani’s main areas of research include computational methods supporting the creation of sonic arts, computer music, interfaces for musical expression, sonic interactive systems, sound synthesis, psychoacoustic sound analysis, music information retrieval, human-computer interaction, machine learning, digital signal processing, embedded systems and real-time audio applications. His work has been published in a large array of international journals and conference proceedings. Dr Fasciani is a member of the International Computer Music Association (ICMA), the Association for Computing Machinery (ACM), the Sound and Music Computing Research Community (SMC) and the Composers and Authors Society of Singapore (COMPASS).